“Romanticism” is characterized by crossing all kinds of boundaries. Usually, the titles of compositions give us insight into how their creators were inspired by literature, landscapes or works of art. But mere titles do not exhaust the phenomenon of crossing borders the least. Many artists have multiple talents. Franz Liszt not only composed, but was also an outstanding piano virtuoso. Robert Schumann had to give up his promising piano career. Both possessed literary talent. 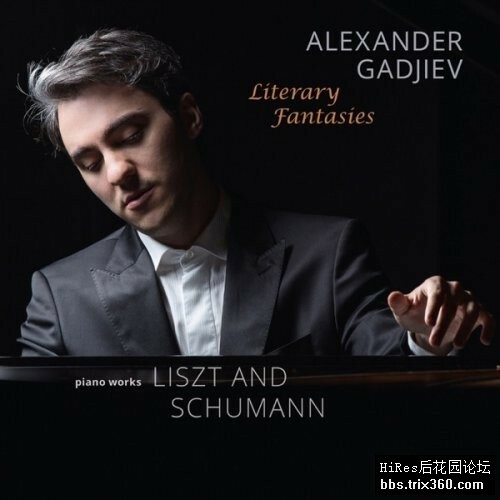 On this new release, Alexander Gadjiev performs works by Liszt and Schumann that were inspired by literature. Tutored by his father, a well-known Russian teacher, Alexander Gadjiev played a solo concerto for the first time with orchestra at the age of nine and held his first solo recital aged ten. He is currently studying with Pavel Gililov at Mozarteum Salzburg and participating in prestigious masterclasses such as the “Eppan Piano Academy” and “Verbier Piano Academy,” both limited to a very small number of selected pianists from around the world. 13. 3 Fantasiestücke, Op. 111: No. 2 in A-Flat Major "Ziemlich langsam"